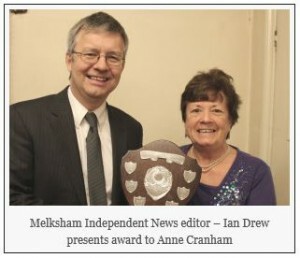 We’re proud as punch to announce that our very own Chil has been named Melksham’s Person of the Year, 2015 by Melksham News. Of course we all already know how wonderful she is, but now everyone else knows, too! Thank you to everyone who took the time to cast a vote. Chil, aka Anne Cranham in real life, has been involved with Broughton Gifford and Holt Scouts for the last 37 years, since becoming Chair of the Executive Committee in 1978. She remains our Chair, but is now also Assistant Beaver Leader (since stepping in as a temporary leader in 1999) and wears other hats within the group, not least Chief Cook and Bottle Washer at numerous events, fundraising ventures and camps every year and Hider and Keeper of the lolly sticks for the annual Easter Egg Hunt on the Common. Beyond BG&H she overseas all the district Beaver colonies as ADC – Assistant District Commissioner – organising many joint opportunities for fun for the young people, from the annual New Year Party to the frankly crazy district sleepover at Boomerang. An ADC does not usually also work directly with the young people in a group, but dedicates his or her time to organising larger events within the district. Chil somehow manages to do both. She has an amazing skill to motivate children and gives them just the help and encouragement they need to do things for themselves, even things that, in every day life, might be considered beyond their ability. She enriches lives and helps children to discover interests and talents that they didn’t know they had. But she is also an amazing support and inspiration to the other leaders in the group, always ready to offer advice to someone when they are daunted by a new challenge. As well as hut sleepovers, the biennial Beavers expedition to Brownsea Island and our annual Group Camp, Chil is also an invaluable presence at the annual week’s Scout Camp – not a soft option when it’s a greenfield site with no services or facilities in the Brecons in the rain! Her campfires are legendary. Chil knows all the best songs and she can get the shyest child or moodiest teenager involved and singing along – children are still singing the song weeks after a camp. Of course, there is lots of hard work in the background that makes it possible for us all to have all this fun. The fundraising efforts Chil drives are vital to the group’s financial security and without these extra funds subscriptions would be substantially higher, and potentially out of reach for some families whose children benefit from the activities and experiences offered by the Scout movement. Whenever something needs repairing, costumes need to be produced for a Christmas show or templates made for a craft session, Chil is there. For more ‘industrial’ jobs, like making a BBQ or repairing the generator, the long-suffering Mr Chil is roped in. She is that rare mix of dependability, loyalty, dedication and selflessness. And the children respect and love her. Give us a B … R … A … V … O ……!! This entry was posted in Uncategorized and tagged Award, Chil by Kaa. Bookmark the permalink.